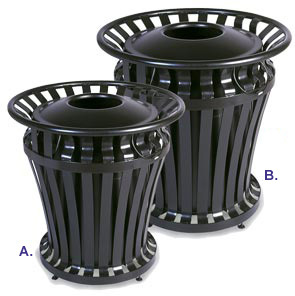 Weathergard® Series Trash Receptacles are perfect for indoor or outdoor use. These waste containers are beautiful and elegant. Steel cable secures the lid to the receptacle for easy removal and access to an easy lift out liner. Liner is included. UV stabilized Powder Coat Finish. Steel Cable Secures Lid & Prevents Theft. Adjustable Feet Stabilize Container on Uneven Surfaces.